2,514 backers pledged $150,469 to help bring this project to life. Grimslingers: Advanced Duels is a standalone micro-game based on the Grimslingers Core Game. In Advanced Duels, 2 players go head-to-head in a duel using element and signature spells. The game also comes with a solo/co-op challenge, where 1-2 players can fight a simulation of the "Witch King," in varying degrees of difficulty to hone their skills. This solo/co-op challenge can also be used with the core game and the expansion's full set of character features (items, archetypes, signature, skills). Simplified and greatly revised based on feedback from our amazing players. We’ve listened, we’ve fixed, we’ve improved! The story picks up where the Valley of Death campaign left off, as players are sent back into the Valley to investigate the aftermath of the the core game, which ultimately leads them on a new adventure across Northern Territory and deep into the underground. Everyone’s favorite Grimslingers, Nyunyo the cat and Cute Kipper the dog, take lead as the campaign's main protagonists. Players will be able to freely roam the entire Northern Territory of the Forgotten West. Resist the siren songs of the Red Maidens as you traverse the treacherous paths of the Red River. Brave the unforgiving cavernous interiors of the border wall known as Gates of Hell. Help or hinder newcomers to the Forgotten West in The Northern Outskirts. Delve into the cryptid creature filled depths of The Down Under. Uncover ancient secrets in The Great Deep. Explore the Valley of Death anew, which has been reworked for the new area system. A uniquely beautiful deck of playing cards, featuring illustrations and designs from Noah Whippie's Bone and Ebon card deck (https://tinyurl.com/zc5ugqc) and re-stylized by Stephen Gibson. Used for various events, card effects and most importantly, procedurally generated area exploration! As you explore the Northern Territory, you’ll encounter legendary chests and the keys to open them, which allow you to acquire the most powerful gear in the game. Nyunyo, Luella, Cute Kipper, and La Fleur Noire will all get their own character specific skills and resources, each one offering a unique play experience! Acquire progress points for completing difficult challenges and amazing feats. Use your acquired progress points to build, customize and advance your chosen character. Prepare yourself against daemons sent to steal your soul, snot-nosed goblins out to rob you of your hard earned loot, adorable mushrooms that have mastered the magical arts and much more! Encounter a whole slew of new randomizations for the creatures you fight, some of which will explode, others scourged by the ether and many more gameplay changing features. These cards bolster strategic play and coordination among teammates to defeat creatures and incentivize a variety of playstyles. ...and more that we’ll be showing over the course of the Kickstarter! Grimslingers, Grimslingers: The Northern Territory and Grimslingers: Advanced Duels all pack a lot of content in a small box! Below are several ways to help you get a better understanding of that amazing content. Looking for a full component list? You can find it HERE. *Current box art is placeholder! Want to get a taste of the spell-slingin’ action? Check out some of the available options below! Tabletop Simulator (Tall Tale): coming soon! How to play a Tall Tale is coming soon! *Note: All reviews are of the 1st edition of the Grimslingers core game. “The game plays wonderfully, and drips with theme.” - Purple Pawn Read the full review here. “Two player, head to head, is loads of fun and trying to play mind games with your opponent packs plenty of entertainment into a fifteen minute duel.” - The Gaming Gang. Read the full review here. “What’s...cool is that there’s an actual honest-to-goodness story here.” - Gameosity. Read the full review here. “When I came across the game... at Gen Con, I was sucked in immediately by the art quality. Luckily, the game doesn’t just look good. It plays good as well.” - The Chubby Meeple. Read the full review here. For all pledges, shipping will be charged after this campaign ends (see the Shipping section for full details) Est. shipping date: December 2017. Receive 1 copy of the Grimslingers: Advanced Duels. *This tier does not include any unlocked stretch goals. Receive 1 copy of the Grimslingers core game, plus all applicable stretch goals unlocked during this campaign. Receive 1 copy of the Grimslingers: The Northern Territory expansion, plus all applicable stretch goals unlocked during this campaign. Note: This requires you to own the Grimslingers core game in order to play. Receive 1 copy of the Grimslingers core game and Grimslingers: The Northern Territory expansion, plus all applicable stretch goals unlocked during this campaign. You will receive a *20 dollar credit towards shipping, 1 copy of Grimslingers: The Northern Territory expansion, 1 deluxe box, 1 collector’s card pack, VIP access, 1 Icarus the Iron Witch resin collector's miniature and all applicable stretch goals. Want the core game as well? Add 29 USD to your pledge! *If your shipping costs are less than $20 USD, the remaining credit will be available to use in the post-Kickstarter pledge manager towards any other items you may wish to get. Receive 1 copy of the Grimslingers: The Northern Territory expansion, 4 player mats, VIP access and the collector’s card pack, plus all applicable stretch goals. Want the core game as well? Add 29 USD to your pledge! You will receive a *20 dollar credit towards shipping, 1 copy of Grimslingers: The Northern Territory expansion, 1 deluxe box, 6 player mats, 1 collector’s card pack, VIP access, 1 Icarus the Iron Witch resin collector's miniature and all applicable stretch goals. Want the core game as well? Add 29 USD to your pledge! A linen finish Deluxe Box, designed to hold all content (including sleeved cards, excluding neoprene mats) from the core game and Northern Territory expansion, including any stretch goals unlocked in this campaign. In addition, the box will come with special divider cards to keep your game well organized! A 17'' tall x 11.5'' wide neoprene playmat illustrated by Stephen Gibson. These player space mats will be designed to organize your play area, provide simple rules reminders and game flow text while looking beautiful on your table! *Note: Art shown is not final. The Icarus the "Iron Witch" miniature is made from high-quality, ultra-detailed resin and is approximately 1.5 inches tall, produced in a light gray color. This is a Kickstarter exclusive item and will be produced in limited quantity! This miniature is included in the Ultra and Super-Ultra tiers now! The Witch King miniature is made from high-quality, ultra-detailed resin and is approximately 3 inches tall, produced in a light gray color. This is a Kickstarter exclusive item and will be produced in limited quantity! Advanced duels is a 2 player variant of the Grimslingers core game. It comes with 2 exclusive grimslingers, Larry and Barceline, as well as two exclusive animas. It features both versus and solo/co-op game modes. In versus, 2 players will go head to head using elements and signature spells to defeat their foe. In solo/co-op, 1-2 players will face-off against a simulation of the "Witch King", which has several levels of difficulty for inexperienced and advanced players alike. The solo/co-op challenge can be used with characters, items, skills, archetypes and signatures from the core game and expansion as well. 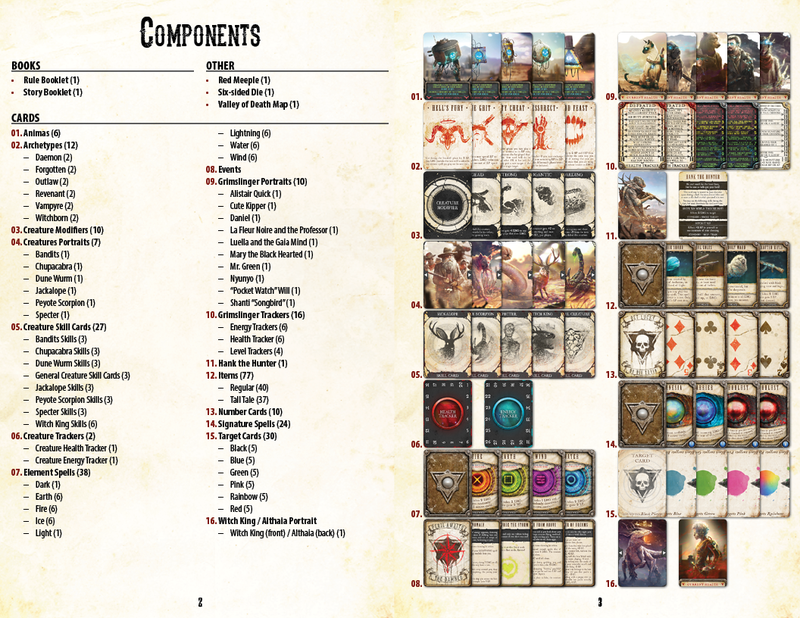 This will give you access to a digital file that contains a full PnP of the Grimslingers Core Game and the Northern Territory Expansion (when completed). It also includes templates for creating your own content, including Grimslingers, Tall Tale Events, Creatures and Spells. It includes a PC .exe file for the unreleased “High Moon” app that the Grimslingers you know today grew out of! (Watch a trailer for it HERE). Contains two exclusive characters cards, Icarus the Iron Witch and Lord Briar, three sets of the light and dark element cards and also a "collector's box" item card. The light and dark elements bring additional variety and strategies to your duels. To add an add-on to your pledge, first pledge for whichever tier you’d like. When you are finished, return to the main campaign page and click the blue “Manage your Pledge” button on the top right hand side. This will bring you to a new screen, with your pledge information. At the top will be the amount of funds you have pledged, and below that the level you have selected. Adjust the total amount of funds you’re pledging (but not the pledge level) by the combined value of the add-ons you wish to add. Alternatively, if you know what add-ons you wish to purchase at the time of your pledge, you may do them simultaneously while confirming your pledge level using the same method. We've got some amazing stretch goals for things we'd love to add to the new expansion and ways to improve its overall quality! As a note, our stretch goals are designed to prevent adding additional development time to the project. This is will help us keep our estimated shipping date realistic. Now unlocked as a paid add-on or a part of the Ultra and Super-Ultra tiers! Linen finish Deluxe Box, designed to hold all content (including sleeved cards, excluding neoprene mats) from the core game and Northern Territory expansion, including any stretch goals unlocked during this campaign. In addition, the box will come with special divider cards to keep the deluxe box well organized and purdy. A Kickstarter exclusive card pack of 5 extra legendary items! This pack will be included for free to all pledge tiers! The Northern Territory expansion will now feature two more cardstock mats, specifically designed to keep creature space organized, as well as the fate, number and item deck. These mats will also include helpful reminder text! A commonly requested upgrade for Grimslingers will finally come true! The Northern Territory expansion will now come with a more thematic looking dice, replacing the one that comes with the core game. The Nothern Territory expansion will come with 2 more cardstock character space mats (increasing the total to 6 in the box). Additionally, all backers will receive two Kickstarter exclusive characters, Red and Henrietta, including their special resource trackers and character skills - a total of 22 cards! The Northern Territory expansion will now come with 3 more general creature skills cards, adding more variety and replayability to the solo/co-op portion of the game! All backers getting the Grimslingers core game and/or The Northern Territory expansion will get this amazing, Kickstarter exclusive, metal, first player marker for free! This token is meant as a replacement for the red meeple that comes in the core game. Five more event cards will be added to The Northern Territory expansion, adding much more variety and replayability to the solo/co-op mode! As well, backers who get VIP Access will gain access to a downloadable PDF campaign (delivery date TBD). As well, the Witch King miniature will be unlocked as an optional, paid, add-on. This double-sided art print will be the same material/finish as the mats in the expansion. If you own the core game, you'll know that the back of the Valley Of Death map had a big picture of the Witch King. This is what we are doing here, except the art print will have two pictures on either side, and both pictures will be chosen by YOU, the community! Voting for what art gets chosen will be done later when more of the game's artwork is complete. Two new signatures spells are going to be included in The Northern Territory Expansion, and two new ones (unique) will be added to Grimslingers: Advanced Duels. The Super-Ultra tier will now only come with 1 collector's card pack. Previously, you would have been getting doubles of cards you wouldn't want doubles of, and more dark and light element sets than are useful. Now everything should be nice and clean! With 9 successful Kickstarters under our belt, we have learned a lot about what it takes to get our games into your hands. One of the biggest things is how variable the cost of shipping can be. As such, we will be charging shipping after this Kickstarter concludes, according to the actual costs incurred to ship to your area. We will do this through our own Pledge Manager system once this Kickstarter has concluded. It the recent past, we’ve faced challenges with fulfilment in the EU, which resulted in some of our backers experiencing additional delays. To avoid facing the same issues, we are working with a new EU fulfilment partner. Wave II of the Defend the ‘Burbs fulfilment is our first campaign with them, and thus far they are exceeding our expectations for communication and diligence. We hope to pass the same experience onto you. Note that the above prices are all import/customs friendly, except for “World.” These numbers are based on regional averages, and are subject to change. These are only estimates and they may increase or decrease based on the quantity of stretch goals we unlock, final box size and weight, and also the current postal prices at the time of shipping. We at Greenbrier games are all lifelong gamers in one form or another who have been leading dual lives. By day working normal jobs, by night (and on weekends) building games. In our spare time, we have formed a successful board game development and publishing company. Grimslingers was originally designed, written, illustrated and kickstarted by Stephen Gibson. However, this is far from a one-man show now, as Greenbrier Games has taken Grimslingers, and Stephen himself, under their wing. Stephen is still designing, writing and illustrating the game, but now he has the help of an experienced team of dedicated individuals to help edit, kickstart, manufacture, ship and refine all aspects of of the game. We are in the final development for Folklore: The Affliction (our largest project to date.) It was completed in January, 2017. At the time of this printing, we are in the process of receiving and approving production samples, which we anticipate will be completed early April. At which point, the full production will begin. Zpocalypse 2: Defend the ‘Burbs shipments have arrived at our new EU fulfilment partner’s warehouse, and shipping has begun. Confirmation that AU shipments have begun is still pending. As of February 15th, 2017, the US shipment of Defend the ‘Burbs is being held by US customs for an “intensive customs scan” at the expense of Greenbrier Games. We will update with more information as soon as it becomes available. From these two games and our other successful kickstarter projects we've learned the ins and outs of nearly every facet of the board game manufacturing world. We've learned how to set realistic goals for both ourselves and our backers, helping to make the process rewarding for everyone involved. Receive 1 copy of the Grimslingers: Advanced Duels micro-game. *Does not include any unlocked stretch goals. Receive 1 copy of the Grimslingers: The Northern Territory expansion, plus all applicable stretch goals unlocked during this campaign. Note: This requires the Grimslingers core game in order to play it. Receive 1 copy of Grimslingers core game and 1 copy of the Grimslingers: The Northern Territory expansion, as well as all applicable stretch goals. You will receive a 20 dollar credit towards shipping costs, 1 copy of Grimslingers: The Northern Territory expansion, 1 Deluxe Box, 1 Collector’s Card Pack, VIP Access and all applicable stretch goals. Want the core game as well? Add 29 USD to your pledge! Note: This requires the Grimslingers core game in order to play it. Receive 1 copy of Grimslingers: The Northern Territory expansion, 4 Player Mats, VIP Access and the Collector's Card Pack, as well as all applicable stretch goals. Want the core game as well? Add 29 USD to your pledge! You will receive a 20 dollar credit towards shipping costs, 1 copy of Grimslingers: The Northern Territory expansion, 1 Deluxe Box, 6 Player Mats, 2 Collector’s Card Packs, VIP Access and all applicable stretch goals. Want the core game as well? Add 29 USD to your pledge!